The Skyline San Diego team represents some of the most veteran, hard-working and meticulous talent in the industry. Our mission is to form a coaching partnership with our clients. We not only produce innovative trade show booth design, but we educate you to get better results from all of your event marketing and trade show experiences. John has 30+ years of marketing experience working with clients to maximize their return on investment in all aspects of their marketing programs. As the Skyline Displays of San Diego team leader he sets the tone for excellence and integrity. He has developed a unique and empathetic understanding of sales & marketing, brand building and revenue generation across multiple industries. John is laser-focused on providing his customers with responsive, expert customer service, and stands behind the quality work he and his team provides. With more than 25 years’ experience in the in the marketing and trade show industry, Joe is uniquely adept at solving exhibitors’ marketing challenges. He works closely with his clients to develop solutions that will produce long-term results and savings. Joe loves a good challenge and will do what it takes to insure his clients receive a successful show. When not inside a show hall helping his clients have a happy experience, Joe prefers to be outdoors on adventures traversing the great landscapes and national parks of our country. Jamie is an experienced marketing and design consultant with over 18 years of experience with Skyline. She is an excellent communicator and has a talent for bringing customers visions to reality. Jamie truly cares about each project and puts her heart into everything that she does. She is extremely organized, enables projects to complete smoothly by creating solid timelines, clear communication and a smooth design process to make sure that all deadlines are met. When she is not working you can find Jamie with her family, reading, exercising or doing anything but cook. For almost 10 years, Clark has been managing the team that takes care of Skyline Exhibits of San Diego’s clients’ booths after the sale. He oversees the installation and dismantle teams servicing their clients’ exhibits as they travel to shows all over Southern California and beyond. He and his team take care of client’s exhibits that are in the Skyline San Diego Asset Management Program, which includes storing them between shows, shipping them to shows and back, repairing any exhibit damage, and reconfiguring exhibit assets to adapt to different booth sizes and messages. Erin has been in the trade show industry for almost 16 ½ years, serving exhibitors from Skyline San Diego (2000-2006, 2016-present) and show management at Freeman. (2006-2015). Erin helps Asset Management clients to manage all their behind-the-scenes logistics so to ensure they meet their timelines and budgets for a smooth trade show experience. She also works with Skyline San Diego clients on exhibit repairs, booth design reconfigurations and any other items that pop up pertaining to their exhibit booth needs. With her many years of experience, Erin has built valuable industry relationships with the San Diego Convention Center and venue-hosting local hotels. 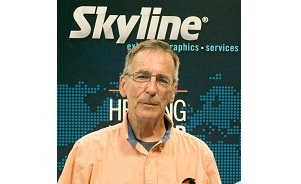 Jeron has over 10 years’ experience in the Skyline Displays San Diego Service Department. In his position as Install and Dismantle Foreman, Jeron is in charge of all I&D services for Skyline San Diego clients at Southern California trade shows and events. Jeron is also a member of the local union in good standing. With over 10 years’ experience in the Skyline San Diego Service Department, Pak is an expert at quickly setting up anything from a 10 foot inline display to an island exhibit as big as a house, with any of the over 20 Skyline exhibit systems. He sets up exhibits at trade shows, events, and also within the Skyline San Diego warehouse to inspect exhibits before and after they go to trade shows. Elton is blessed with the planning gene and helps keep organized the constant bustle of client exhibits shipping out to trade shows and back to the Skyline San Diego Asset Management warehouse. He also helps assemble, inspect, and repair exhibits held in the Skyline San Diego Asset Management Program. Since 2007 Sarah has helped ensure clients’ trade show display orders are entered punctually and accurately. She also welcomes visitors to Skyline at the front desk and on the phone. When not working at Skyline, Sarah likes to go for runs, cook, and shop. Jack’s role at Skyline is to follow the participation of San Diego area businesses and organizations at trade shows and marketing events both foreign and domestic, with the goal of promoting the unique abilities of the Skyline and its 130 locations around the world. Jack not only introduces new exhibitors to the advantages of working with Skyline but also is constantly reaching out to our existing clients for new opportunities to improve or expand our partnerships. Marketing managers from numerous local companies have expressed appreciation for Jack’s reminders that they need to get moving on that upcoming show! Our local team is backed up by Skyline Exhibits, Inc., one of the world’s largest producers of lightweight modular exhibits and graphics. 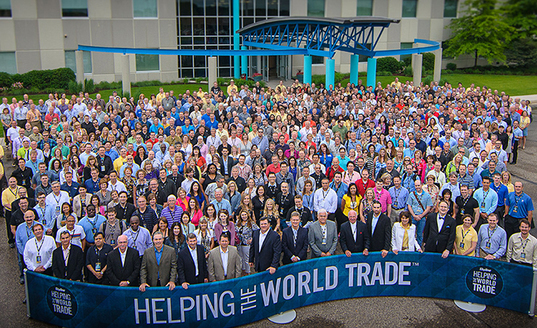 Skyline customers have 24/7 access to the most extensive global service network anywhere–some 1,500 team members in 128 design centers in 31 countries, which includes full service rental, product and graphics production centers in Las Vegas, Chicago, Toronto, Orlando and of course, Skyline World Headquarters in Eagan, Minnesota.